Is blue not your color? With Bugatti passing around some photos of the new Chiron in a solid navy blue and a two-tone configuration with a lighter blue, it may not suit your fancy. 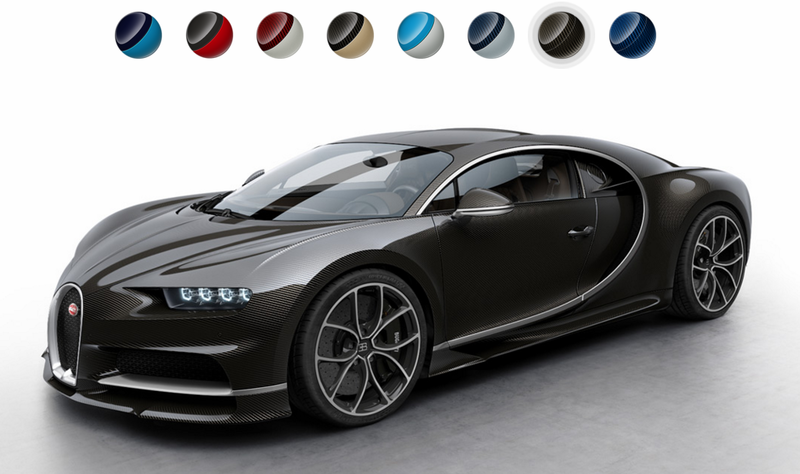 The answer: Bugatti’s new configurator. Customization is part of what makes Bugatti so unique, so surely there will be some very impressive renditions coming out, similar to Bugatti’s 20+ different versions of the Veyron. With the online configurator, you have your choice of 8 color combinations, with several corresponding wheel options, while viewing the car from a few different angles. What’s your favorite color combo? Ours is the carbon fiber, below. Introducing Dealer Spotlights – a new thing we’re going to be doing at The Autocracy, where we go to premium brand dealers or locations that have a unique variety of vehicles and share information about them and the products and services they provide. Here is our first Dealer Spotlight, Lamborghini of Paramus. As the only authorized Lamborghini dealer in New Jersey, Lamborghini of Paramus proudly offers a vast selection of new and selected pre-owned cars as well as service, parts and merchandise. Established in 1969, Lamborghini of Paramus has been around just 6 years less than the Lamborghini brand itself. Lamborghini was founded in Sant’Agata Bolognese Italy in 1963, and since then, they’ve produced some of the greatest looking, most highly detailed sports cars over the last century. Some select models in their inventory include an Arancio Argos Pearl 2013 Aventador with under 5,000 miles, a Nero Noctis 2012 Gallardo with 6,000 miles and the pièce de résistance, a white 1990 25th Anniversary Edition Countach with just over 12,000 original miles. Renowned for their excellent customer service and close proximity to New York City, Lamborghini of Paramus invites you to stop in – located on Route 17 South in Paramus, New Jersey – and check them out online.